Whether you’re searching for your first house or looking to downsize from the four-bedroom split-level where you raised your kids, the home-buying process is daunting. From browsing listings to making an offer to shelling out on closing costs, there are a lot of moving pieces to keep track of well before you get to the actual moving-in part. Through it all, avoiding common home-buying mistakes is just as important as finding the right home. Missteps and savvy choices both impact your bottom line. There’s no denying that buying a home is a financial reality check. The fees, the interest rates, the insurance you pay on the mortgage you pay — it can feel a little like landing on all the bad squares of a Life game board. Still, the majority of Americans say that home ownership is a part of their American Dream. And this longing for property that we all share is more than abstract—property is an investment in your future. A well-maintained house is an asset that should, at the very least, keep its worth against inflation and, at best, increase in worth as real estate values rise. 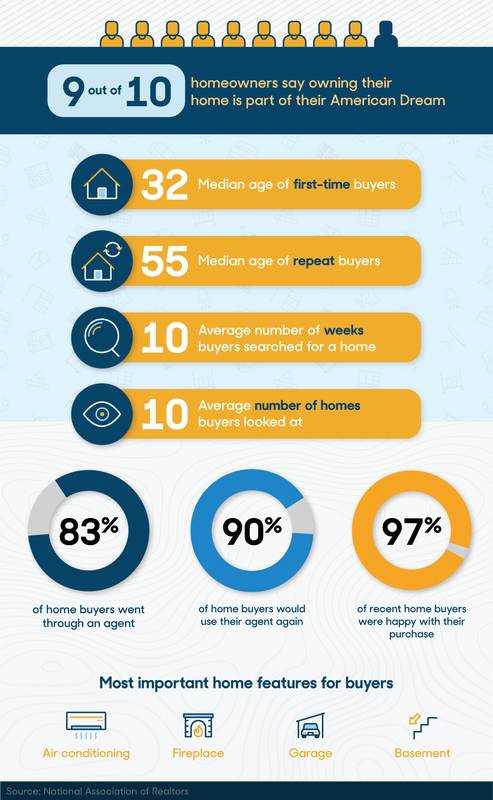 If you’re interested in buying a home and under 72 years old, you probably started your home search by opening a listings app and scrolling through properties. You can learn a lot about your area’s housing market by browsing what’s for sale, but you’re putting the cart before the horse. Get a good grip on your financial situation first so you know how much house you can afford and how the ticket price breaks down into monthly bills. Your credit score and account balances directly inform how much money a lender will trust you to pay back. Increase your credit score. Pay off credit card debt and don’t open up any new lines of credit. Bulk up your accounts. Deposit any monetary gifts that a family member, for example, has promised to contribute. Lenders will want to see account statements, so this money should be in place for two months before purchasing. Avoid making big purchases. This is a time to conserve, of course, but you also want to keep your numbers steady as you move through the mortgage process. You don’t want your lending institution making any eleventh hour changes to your loan amount. Pre-qualification and pre-approval are terms often used interchangeably but they’re actually different. The first can give you an idea of how much loan you’ll qualify for, but it’s just based on information you supply. The second is more official because you furnish hard data and agree to credit checks. Leverage your circle to find a good loan officer or a good realtor. Whichever you find first can likely recommend someone for the other role. If you do check the rates of different mortgage brokers, try to keep the process within a 45-day window. That way, the multiple credit checks will only impact you once. Don’t assume pre-approval is as good as being approved for a mortgage. Depending on the amount of time between pre-approval and when you’re ready to sign, you’ll likely have to update a lot of the financial information. Any changes to your financial picture could impact your approved loan amount, and the chance of that increases as time passes. Also, keep in mind that pre-approval only lasts for three months. Don’t feel like you have to spend as much as you’re approved to spend. Grab a pencil and paper—it’s time to figure out how much cash you can put down now and how much you can comfortably afford to pay monthly. Know your cash flow. Bankrate offers a handy home budget calculator to help you figure out exactly how much money is entering and leaving your life. Plug in income and bills, including your current housing costs, to see your savings potential. Tweak the numbers to find how you can change your consumption habits and store away more acorns. Then figure in what your monthly bills would be as a homeowner, based on the interest rate and house price your pre-qualification has given you. Set an upper limit. Use your personal budget calculations and your pre-approval letter to set a budget. Be strict with yourself about only looking at houses at or below this limit, keeping in mind that 1) bidding wars can quickly drive up costs and 2) if you opt for a fixer-upper, it should be sufficiently below your upper limit to allow for renovating costs. Don’t ignore closing costs. Property fees, loan fees, mortgage insurance fees, title fees can quickly add up to 2-5% of a home’s list price. Having enough for both a down payment on the house and closing costs is the immediate financial challenge of buying a home. Talk to your realtor about the possibility of working the closing costs into your offer — the seller will sometimes agree to cover them. Your list of ideal home requirements — wraparound porch, trees on property, big windows — should be well-known to your realtor, alongside some brass-tacks considerations. Consider your ideal neighborhood. There are a lot of things you can change about your new home—the light fixtures, the paint, the whole darn kitchen—but neighborhood isn’t one of them. Let your realtor know if a quiet street, nearby shopping, or a good school district tops your list of must-haves for location. Factor in your commute. If the suburban cul-de-sac of your dreams isn’t worth becoming a super commuter (traveling more than 70 minutes each way for work), scale down your search radius. People rarely find the home they wind up purchasing just from stumbling through the doors of an open house. That said, browsing real homes—not just highly selective photos of homes—can go a long way in teaching you what you love and hate in real estate. It also gives a tactile sense of how big a three-quarter bathroom is, and how inconvenient it would be to have to traipse into the garage to do the laundry. Take a comprehensive tour. When visiting a home that you are seriously interested in buying, take a slow tour (or two)—open every door, drawer, and closet, and snap pics (with permission). Don’t assume you understand the neighborhood based on a single visit. Check out potential properties at different times of day and night to see how the vibe changes and what kind of activity goes on. Ask neighbors about their experiences living in the area. And check out the vicinity on Google Earth. Half a mile away from a waste plant? Good to know. Real estate, much like the stock market, is an emotional business. That’s why an attractive offer isn’t always just the highest offer. Write an offer letter. Introduce yourself. Talk about how the house figures into your plans for the future and how you see yourself using the space. This isn’t a time to talk about how that outdated wood paneling has got to go—save the negotiations for your realtor. Instead, personalize your interest in the house and build off of any particulars that you know about the seller. Did they raise their kids in the house? Mention your hope to raise a family of your own there, too. Provide earnest money. A bird in the hand is worth two in the bush, right? That old adage nicely describes earnest money. That’s a lump sum that you put in escrow soon after making your offer and shows that your offer is, well, in earnest. If you pull out of the deal for just a change of heart, it’s money that the seller is free to keep. If you go through with the sale, it counts towards the price of the house. Earnest money makes a bigger deal out of, say, a $5,000 increase over the asking price. Don’t wait to pull the trigger. If a home has everything you’re looking for, get your offer in as soon as you can. The earliest offer has the edge, particularly if they’re reviewing offers as they come in. The appraisal and inspection will cost you several hundred dollars each, but they’re a worthwhile investment to make sure the price you said you would pay in your offer is what the house is really worth. You hire an inspector. This is a third-party company who will go through the house top to bottom, from the plumbing to the wiring to the roof. It’s a 2-4 hour in-depth examination that will force you to confront problems deeper than the mustard-painted walls. Accompany the inspector on their tour of the house—it’s a great opportunity to learn about your prospective new home. The lender hires an appraiser. The lending institution has their own version of an inspection, called the appraisal. In this step, the bank makes sure that what they will be lending you isn’t more than the house is worth. There are plenty of programs out there to make buying a first home more accessible. FHA loans are a popular choice for people buying their first house, as well as for people who have less than stellar credit. With Federal Housing Administration backing, you can put as little as 3.5% down on a house. VA loans are available to service members, veterans, and surviving spouses. These loans are among the most generous available, sometimes asking for no down payment whatsoever. USDA loans are backed by the U.S. Department of Agriculture and look to support buyers looking at homes in rural areas. Like VA loans, there’s a possibility of qualifying for 100% financing. While you may be prepared to throw everything not nailed down into your down payment, that’s not the only demand being made on your cash. When a house “closes,” the title is transferred from the seller to the buyer. The costs associated with this process include processes like the inspection and appraisal and a whole host of fees—survey fee, underwriting fee, recording fee. While it may be tempting to scrape your accounts clean in order to put 20% down and avoid paying mortgage insurance, going into home ownership with no safety net is a bad idea. It’s a good idea to try to conserve at least six months of living expenses. In fact, some lenders require you to keep a certain amount of cash in reserve in order to get approved. You want an emergency fund, of course, but there’s also a good chance you will want a little cash for sprucing up your new place. The experience of buying a home is different the second or third time around. For one, you likely have or will have cash on hand from selling a previous residence, meaning that you may be largely free of worrying about the mortgage process. Making sure you’re working with trustworthy people and finding a home suitable to age in become top considerations. A smaller, newer home with less upkeep is on the agenda of most home-shopping seniors. If aging in place is your plan, look for single-level floor plans, accessible bathrooms, and entryways that will be easy to maneuver even as mobility declines. Use moving as a reason to streamline a lifetime’s worth of garage, attic, and basement paraphernalia. And when you’re ridding yourself of Easter decorations and embroidered cushions, be sure to collect donation receipts. A year in which you buy a home is a big tax write-off year. Make the most of it. Transporting the contents of a home is no mean feat. Hire some reliable moving help to assist you with the entire process—packing and loading to unloading and unpacking. Their associations. Realtors belong to a local real estate organization that’s affiliated with the National Association of Realtors (NAR). This membership means they align with the NAR’s ethical guidelines, but that doesn’t mean real estate agents are comparatively shady. Anyone who deals in the housing market is beholden to state laws. Why enlist a realtor or real estate agent? The percentage of home buyers who worked with a realtor or real estate agent has been steadily climbing since the early 2000s. Having someone knowledgeable by your side while navigating the technical complexities (not to mention emotional tribulations) of real estate is an obvious perk. The fact that the seller pays for their services is another: The cut of both the agent who represents the seller and the agent who represents the buyer are built into the price of the house. Back in the day, another good reason to go through a realtor was because they alone had the resources to follow the local housing market. An MLS, or multiple listing service, is a compilation of for-sale houses and was once available only to realtors. Now, the likes of Redfin and Zillow mean anyone can look at the ownership history and square footage of houses as they pop up. Realtors still tend to use their own professional apps, but the real value of a realtor is who they know. Real estate is a people business. Referrals and relationships are at the heart of negotiations—realtors spend a lot of time on the phone with other realtors. They can ferret out the right information and read into vague clues. What are the best house hunting tools? Glean property market info wherever you can—online forums, realtors, attorneys, old-fashioned print listings—but keeping tabs on one or two highly frequented housing apps could be enough to help you find your home. Most agents and sellers place their for-sale properties on all the popular apps, so chances are high that even if you just browse a few apps, you are still seeing everything out there. Pre-qualified: An initial screening by a lender in which you furnish some basic financial information and they give you a rough estimate of how much house you are able to afford. Pre-approved: A more formal step in the preliminary mortgage process. More in-depth financial info is gathered, including a credit check, tax returns, bank statements, and pay stubs. The resulting pre-approval letter is something you can use in the bidding process to show you are prepared to buy and can foot the bill. What’s the difference between appraisal and inspection? Appraisal: If you’re taking out a loan to buy your house, the lending institution wants to make sure that the price you’re paying isn’t higher than what it’s worth. For much of the lifetime of your loan, the lender owns more of your house than you do. Should they have to sell the property in order to recoup their investment, they want to make sure it would fetch a price equal to or greater than the one you (they) paid. Inspection: The appraisal protects the bank’s investment, the inspection protects your investment. Either before or after making an offer, it’s up to you to hire an independent inspector who will spend a few hours examining the house, from the roof tiles to the crawl space. The inspection report surfaces issues ranging from safety hazards to major repairs to routine maintenance items. This info is the basis of any final negotiations and allows you to make an informed decision whether or not to buy. If you request repairs, the seller can either make them, give you credits (such as shouldering the closing costs), or decide to put their house back on the market.